For a stylish and chic look, these Creole earrings from Evoke are the perfect addition to your jewellery box. Crafted from precious sterling silver and plated with yellow gold for a luxurious finish, these gorgeous Creole earrings feature an intricate twist design set with shimmering crystals for a sparkling finish. 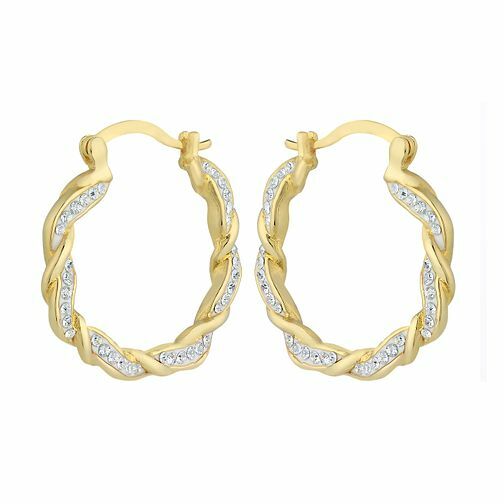 Evoke Silver & Gold Plated Crystal Twist Creole Earrings is rated 5.0 out of 5 by 2. Rated 5 out of 5 by Anonymous from Absolutely love them! Bought for a Christmas present but they are absolutell gorgeons! Rated 5 out of 5 by Anonymous from Earring This product had perfect design box very good quality earings that was great value for money thank you.